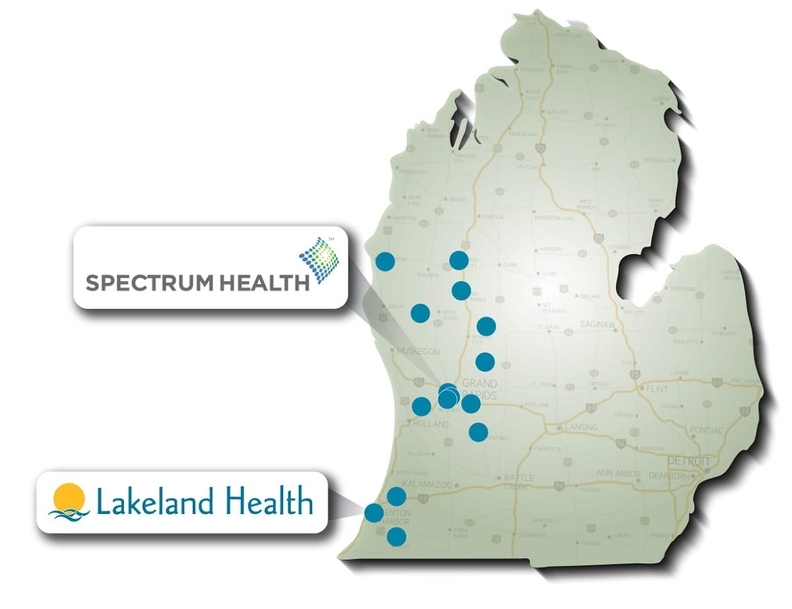 The locations of Spectrum and Lakeland hospitals, in a map provided by the systems. 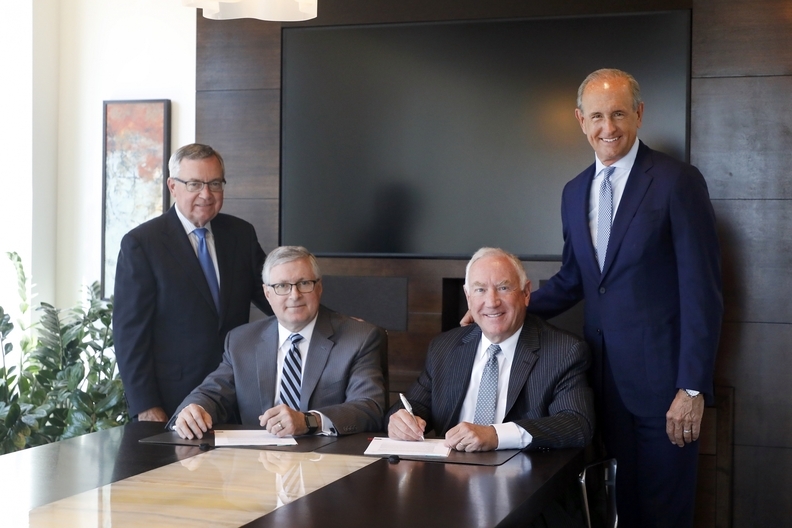 Grand Rapids-based Spectrum Health, one of Michigan's largest not-for-profit health systems, and Lakeland Health, a three-hospital system based in St. Joseph, have signed a letter of intent and expect to merge by Oct. 1, officials said Wednesday. "We have a long-standing relationship with Lakeland Health and admire their excellent clinical care, strong leadership team and commitment to the community," Richard Breon, Spectrum's CEO, said in a statement. "Our board has spent the past year diligently focused on our growth and partnership strategy in the context of current and anticipated future trends in the industry, such as consumer-centric care and precision medicine," Breon said. "This integration brings benefits to both organizations in terms of improving affordability, quality and access." Some in the Michigan health care industry believe that Spectrum, which includes 12 hospitals, 180 ambulatory care sites, an employed medical group and the Priority Health insurance company, has had similar discussions with other smaller hospital systems. Under the proposal, Lakeland would become a division of Spectrum and retain a local board and charitable foundation. Lakeland's three hospitals and outpatient facilities employ more than 4,000 workers and 450 doctors, nurses and other providers. "We are excited about what our two organizations joining together will mean for our community. Lakeland's number one priority has been to take great care of our friends and neighbors — the integration with Spectrum Health will provide an unprecedented opportunity to do that even better," Loren Hamel, M.D., CEO of Lakeland, said in a statement. "The benefits of integration will be many. We see great value in sharing and standardizing our approaches to continuously improving the health care we provide, to enhancing the overall health of the communities we serve, to lowering the overall cost of care, and to make our organizations the best places to attract the best talent. Spectrum Health's top tier performance, geographic proximity, and cultural similarity will make this a great partnership." Dan Hopp, Lakeland's chairman, said the health system decided it needs to join a larger system to achieve its long-term objectives. "I have been impressed by the cultural fit Lakeland has with Spectrum Health — their commitment to innovation, employee relations, and quality aligns well with ours," Hopp said in a statement. "Spectrum Health offers capacity beyond our ability to develop locally. Being part of a larger system will truly benefit our community." "Spectrum, Lakeland Health consider merger" originally appeared in Crain's Detroit Business.